Your comments on the object http://www.youtube.com/watch?feature=player_embedded&v=Ne3qSqjaH7A&gl=RU Obs: (8:41 PM) Filming the sky today 25 September 2011 in Florianópolis, Santa Catarina, Brazil [and from another] There were reported grid and phone outages. A cell phone outage in LA on Saturday 9/24 was followed by sudden and seemingly simultaneous electrical outages on 9/25 from Chile, Karachi, Ontario, Idaho and Arizona. http://poleshift.ning.com/profiles/blogs/power-blackout-stuns-chile-halts-copper-mines [and from another] Red sky was noticed and photographed, including a red sky at night! http://poleshift.ning.com/profiles/blogs/red-sky-at-2-30-in-the-morning-i-have-never-seen-the-sky-red and on August 24, 2011 http://poleshift.ning.com/photo/img-7039 [and from another] Debris in the form of fireballs were reported http://lunarmeteoritehunters.blogspot.com/ on 9/25 from Quebec and Ontario http://www.godlikeproductions.com/forum1/message1653426/pg1 down through Vermont and even Pennsylvania. Louisiana around Baton Rouge reported a fireball, seen by many from Florida to Texas and up to Missouri. Buenos Aired http://poleshift.ning.com/profiles/blogs/explosion-what-happened-in-esteban-echeverr-a-argentina-monday reported a fireball with an explosive landing also. 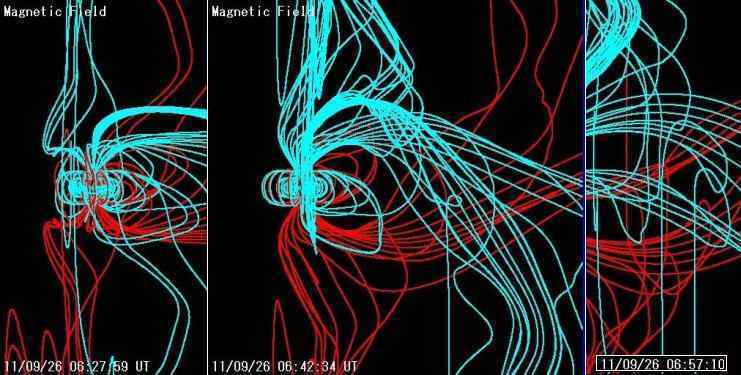 [and from another] The magnetic simulator located in Japan had been down during these days but came back up on September 26, 2011 showing wild contortions of the Earth's magnetic field. Clearly something had the Earth in a magnetic grip, and this was something that was dusting the Earth with red dust! Where NASA will try to explain this as emissions from the Sun and fragments from the dying satellite which came down in the Pacific recently, they cannot explain the red dust in the atmosphere. Red dust quickly brings up, in an Internet search, the prophecies about the return of Nibiru, along with our many references to it in the ZetaTalk website. Opps! NASA failed to dream up a cover for extensive and brightly colored red dust! Drifting sands from the Sahara simply don't cover it. What does explain all the symptoms of a tail waft are our descriptions. ZetaTalk, and only ZetaTalk, has talked about a planet between the Earth and Sun, shrouded by red dust and pointing its massive debris filled tail toward Earth. Our explanations, and only our explanations, cover red dust, fireballs, blackouts, and a horribly twisted magnetic field. Where will this lead? NASA will attempt to grab the media stage, preemptively explaining what occurred. Then when this scenario repeats, as it will on an increasingly frequent basis, their explanations will fall flat. Is the Sun in a constant state of upheaval? Are satellites falling on an almost daily basis? Does debris from falling satellites have the appearance of the debris silhouetted against the Moon? How is this related to the trembling and incessant earthquakes? Earthquakes, red dust, hail and pelting debris, and volcanic eruptions are predicted in prophecy and related to the End Times. This is where NASA will fall on their sword, and lose stature utterly. I´m surprised that nobody has asked about the earthquakes in the Canary Island of "Hierro" (the most southwestern island). More than 8000 minor earthquakes have been recorded until today. Officials have evacuated the town nearest the active volcano I know Zetas have claimed that there won't be a tsunami toward the eastern USA coast but is this a sign of the 7/10 African roll? [and from another] http://www.elpais.com/articulo/english/Canary/Island/volcano/may/soon/erupt/elpepueng/20110925elpeng_5/Ten [Sep 25] The Canary Island of El Hierro, the smallest and farthest southeast of the Spanish Atlantic archipelago, is steeling itself for a possible volcanic eruption after a series of tremors was felt during the weekend. [and from another] http://www.elpais.com/articulo/sociedad/Desalojadas/300/personas/Hierro/riesgo/desprendimientos/elpepusoc/20110927elpepusoc_11/Tes [Sep 28] Troops of the Military Emergency Unit (UME) in the Canary Islands this afternoon departed by boat from Tenerife to El Hierro to assist in an eventual evacuation of the island to the risk of volcanic eruption and earthquakes that are becoming more intense. The Canary Islands make people nervous because they are in a tenuous position. Formed from volcanic lava flows which in some places are supported by the ocean. The lava in these places has air bubbles in it and is therefore equivalent to the weight of water, thus floats. We have addressed as invalid the speculation that these floating projectiles of hardened lava might break off and cause a tsunami. Why then are the Canary Islands so jittery, no pun intended? There are no fault lines under the Canary Islands, but they are narrow projectiles sticking up above the waves, and as such vibrate when the African Plate frees itself along its long border with the Mediterranean, down through the Red Sea, down through the Indian Ocean and up through the Atlantic. Particular the pulling apart of the Atlantic, already in process, creates a jitter on the eastern side of Africa. Those on the Canary Islands feeling nervous about this ought to take the clue, as those who remain on the island will not survive the pole shift. I am wondering why I can't see the second sun that others see in others regions? Is it because of being so far north here in NB Canada that Planet X is directly in line with the Sun blocking its view? Also there is constant spraying of the sky trails in the evening before sunset. The other strange phenomenon I notice is the Moon flips a full 180 degrees. I visited a place in the New Brunswick - "Hope Well Rocks Centre" - way back when it opened like 11 years a go. On the wall it shows the phases of Moons and the "face of the Moon" is alway right side and this display is still there when I revisited this summer, proving to me there is something affecting the moon. The other phenomenon is the sun sets and rises here in different areas every 1-2 weeks, some days it rises normally and sets normally but then the next day way off about 20+ degrees. Just some thing I have noticed but no one wants to speak about it. I was also wonder why type of filter or color of filter could be used to get a glimpse of Planet X if its even possible to view from New Brunswick Canada. Those who have noticed the undeniable signs that a planetary body is in our inner solar system, between the Earth and Sun and creating an Earth wobble and a highly eccentric Moon orbit, are understandable anxious to have a personal sighting of this body for themselves. We are often asked for specifics on the exact spot to focus on, as then a camera with filters can have a target zone. Planet X is slightly to the right of the Earth if one were out in space, gazing in, as it is coming at the Earth in a retrograde orbit, pushing the Earth back in her orbit. This has been described as the 4 o'clock position, if one assumes the viewer to be standing with their head pointed north. But it's not that simple. The first issue is the angle of the Ecliptic. This is a new concept for most, as other than the general location of the rising or setting Sun, or the Moon's path across the sky, and the thought that the Earth rotates west to east, it is not a concern. If one considers that humans on the surface are either standing upright at the N Pole, and upside down at the S Pole, and laying on their side along the Equator, then obviously the view changes depending upon locale. The 4 o'clock position moves. You must check planetarium software to determine where your Ecliptic is located for your time and place, and then determine the 4 o'clock position. Remember than for the Southern Hemisphere things will also be upside down. The second issue is the Earth wobble, and the dance that Planet X and the Earth are in at present. The Earth wobble includes a lean as it forms a Figure 8 with its N Pole. This lean also skews your view of the Ecliptic, changing the angle. Then there is the bobbing about that the Earth is doing as it flips about trying to align with both the Sun and Planet X, magnetically. Earth leans her N Pole away from the hosing coming from Planet X, then suddenly flips into opposition leaning its N Pole toward Planet X instead. both Planets are on the move during this dance, increasing the distance between them or coming close, bobbling up or down above or below the Ecliptic also, so just what the angle vs a vs the Sun you are seeing might be is a guess, on any given day. The recent photos of Planet X from Rio show yet another variable that must be considered. Since Planet X is slightly below the Ecliptic, light from Planet X makes a more direct trip to the Southern Hemisphere than to the Northern Hemisphere. Light bends along the curve of the Earth, pulled down by gravity, so those in the Northern Hemisphere are actually seeing Planet X at a distorted location! The degree of distortion increases the further north one lies. This is likewise true of the Southern Hemisphere, but to a lesser degree. This distortion of light rays is what causes the Sun to appear huge at sunrise or sunset, when red light rays, most prone to bending, are predominant. Thus most Second Sun sightings occur at sunrise or sunset, as these bending rays first go out, then bend back to the viewers eye, making the Second Sun appear large. Recently I received a short video composed of interviews of people who had had a Near Death Experience (NDE). In almost all of these cases, the recalls were of what we've come to know as the "classic" experience - leaving the body and feeling at peace about that, moving down a tunnel with a light at the end, being greeted by lighted beings, friends and family, being suffused with a wonderful sense of unconditional love, the feeling of having "come home", and certainly not wanting to return. [and from another] http://www.forbiddenknowledgetv.com/page/5025.html We know that Earth is facing a 90% die-off event, so it is highly likely that those of us who are preparing for the PS will, along with all else that will be needed, also be called upon to assist the dying. For those souls that are sparked and reincarnating, I presume that they will go through a process generally similar to the NDE's described above. If that is so, they could be emotionally assisted by the soothing reminder that friends and family are waiting for them, to just go ahead and move down the tunnel towards the light, that they will be greeted and have nothing to fear, words of this nature. But what about the unsparked souls? The Zetas have called these "aborted entities" and that the soul "is prone to dissipation upon the death of the human" (From ZetaTalk: Aborted Entities written Dec 15, 1995). What will their experience be? Will they feel great fear as their consciousness dissolves? Is there anything we can know that would help us to ease their passing? We have been told that the rural areas have a higher percentage of unsparked souls, so it seems quite probable that this situation will present itself over the days and months following the PS. Then, jumping to the opposite end of the spectrum, what about the Star Children? What kind of dying process do they go through? Similar to that of any sparked soul? Would they be assisted by the same deathbed attendance as a terran-born, with the same words of assurance as above? Or will they, by their nature, have a different experience than other soul types? Presumably they will be helped by their disincarnate group members? "Star Children seldom operate alone, but are assisted with others from their group who operate disincarnate, in the main" (From ZetaTalk: Star Child written Jul 15, 1995) I, for one, would like to be as equipped and knowledgeable as possible on how best to assist all the soul types in their dying process, should I be called upon to do so. Many reporting on their NDE report the tunnel of light, being greeted by friends and family, and a feeling of being embraced, loved. Most often a NDE is brief, as the person is being snatched back from the jaws of death, so only this initial impression is recalled. Had the processing of the newly released spirit proceeded, it is not all a love story, however, as those with issues are also there to greet the soul's passage. Those experiencing otherwise find their stories are not welcomed by the general public who would prefer to think otherwise. We all go to Heaven, is the attitude. Those who have lived a life devoted to Service-to-Self concerns find the souls waiting with issues to be angry, at last wanting to be able to tell their story and place their anger where it belongs. Unsparked souls, as we have detailed, dissipate immediately upon death of the body. There is no tunnel of light as there is no soul to participate. Likewise, what Star Children experience should not be your concern, as if you are a Star Child you are well aware of what occurs settling one incarnation and moving to another, as do other Star Children. The basis of the question today is how a human, wanting to be a teacher, wanting to give comfort to humans dying potentially en mass after the pole shift, can preach about what is to come at the moment of death. This is not your responsibility, nor could you in any way know what an individual soul can expect! It is the responsibility of the Spirit Guides, who are nearby well before the moment of death, and in consultation with the soul about to pass. In that the human body suffers pain and has anxiety, you can reassure them that this will soon all be over. Anxiety about dying most often is present in those who know they have done wrong in their lives, and fear the critique they will receive upon passing. If a Service-to-Self soul, they may view the life they are losing as one of their better stints, and fear being placed into a crippled body, or one enslaved by others in a future incarnation. If not fearful, they will be resentful that others get an opportunity to go on record with their complaints. But you, as a human, cannot determine if the soul is Service-to-Self or the human simply anxious about immense pain at the point of death. The pain of a heart attack is extreme. The spasms from organs infused with cancer can likewise be excruciating. But a reassurance that this will all pass is certainly a blanket assurance that would cover all these bases. Should you tell the dying human that he is going to a better place, will be met by intense love, and will be joined by all those he loved and who loved him in the past? Be a liar? The dying human, in touch with his soul and the process, is likely to close his ears to your attempts at being his preacher and guide. The Spirit Guides are in consultation with him, long before death, and are telling him the truth. They are telling him a truth you could not possibly know. Rather than preaching, why not be a listener! Ask him to tell you what he is sensing, and go on that journey with him, as a friend. Listen, and pat his hand. Cry with him if the moment requires it, or share a laugh and a smile likewise. Let him tell you about his process. Norway of course is in the stretch zone, pulled apart as is the region around the Black Sea. The strain on the great Eurasian Plate will only ease during the hour of the pole shift when a new seaway is torn up along the western border of Afghanistan, up into Russia. Meanwhile, it will sing, and moan, and howl. Drammen, Norway is on a river and as a port is near water, and thus has two reasons to be vibrating. River bottoms are low land because the crust is weak at those points, sinking, and thus as a thin membrane is more prone to vibrate than a thick crust. Tones are heard where water can be set to vibrating, which is true of a port area draining a river. In fact, multiple water pools, all vibrating at a different rate, will create the music, the multiple tones, recorded so clearly at Kiev. In the sound of the Drammen music, which seems to be a twirling sound rather than holding a steady tone, lies the answer to why the lake at Romsdalen, Norway has a lake draining with a swirl in the wrong direction. The Coriolis Effect is more than the motion of the Atmosphere and oceans curling away from the Equator as the Earth turns, rolling back counterclockwise in the Southern Hemisphere and clockwise in the Northern Hemisphere. The Earth's rotation affects the magma likewise, in a similar manner, as it is being driven by a rotating core that moves faster than the magma, as mankind's scientists are aware, just as the Equator moves faster through the atmosphere and oceans than the regions closer to the poles. Note that Norway is high land and thus thick crust. The Atlantic is pulled into the fjords where it is trapped by steep hills on either side, rising up into the air as well as deep into the water. What happens to this land, and to the water trapped in the fjords along its shore or in its lakes, when the stretch sets all to vibrating. A vibration, by its nature, is back and forth, a pull and release with bounce back and a return to a pull. When the stretch pulls the water flows toward the east in the fjords at a faster rate, as there is a void there to be filled, and in an inland lake will likewise flow east in a clockwise manner at a faster rate. The void created by this pull of the land eastward allows the water to temporarily rush into this pool, this void, without any particular swirl direction. Now the bounce back occurs against these temporary pools of water and where will it go? Water takes the path of least resistance and thus will not flow backwards against the swirl already in process, the Coriolis Effect clockwise swirl. It seeks another route, flowing away from the clockwise swirls which have rapidly moving water both before and after the temporary pools trapped along the fjords or caverns under the inland lake. Thus it begins to move in a counterclockwise manner, to other spots not under this intense pressure. Watch the swirl in the lake at Romsdalen while listening to the twirling sounds from the coastal port at Drammen and the dance that the land and water are performing becomes very real! Certainly China is a rising power and it should be no surprise that it has entered the space race too, competing with the US and Russia. China launches satellites, so is hardly a newcomer to the field. Since China is building ghost cities, in preparation for the devastation that the passage of Planet X will bring to their lands, are they not also aware of the devastation that the debris in the tail of Planet X will bring to the skies? At this point in the game, the key piece of information the establishment wants to garner is timing. For China, who will not be a participant during the 7 of 10 scenarios to the same degree as the US and Europe, this is primarily a clue as to when the Last Weeks might start. They plan to move their elite to the ghost cities, position their military along their southern borders to block migrants, and take steps to protect their infrastructure from damage. All keyed on timing!